Sometimes you don’t have to go far to find beauty. Camiña Balay nga Bato is an ancestral house and compelling cultural attraction in Iloilo, the city where I was born. There are a couple very good reason to visit, including hot chocolate, dumpling soup, handwoven textiles, and amazing antiques. Take a look. Camiña Balay nga Bato means ‘house by the river’. Built between 1860 and 1865 in a style we call ‘arquitectura mestiza’, the house is a beautiful example of indigenous Filipino building merged with colonial Spanish influences. Luth and Gerard Camiña, 4th generation owners, spent 10 years renovating Camiña Balay nga Bato into the treasure you see today. The original wooden posts, 24 massive rough hewn tree trunks known as haligis, still hold up the building. Fun fact: Typically the number of haligis in a house was a sign of the family’s wealth. The more you of these posts you could afford, the bigger you could build your home. For a very reasonable price, Camiña Balay nga Bato will serve you Iloilo’s best pancit molo and tsokolate in their sunny ‘balcon comedor’, or casual dining room. 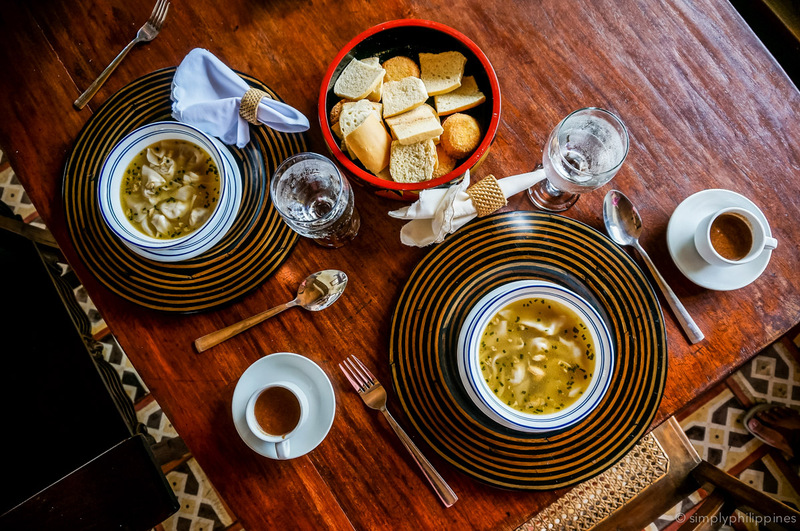 The molo soup comes from the kitchen of Kapitan Ising, a local legend. Each dumpling contains pork, chicken and shrimp, encased in a soft rice flour wrapper. The broth is full of flavor but lighter than you’d expect. Not much to say about this one, you have to try it to understand. In case you’re wondering, you’re allowed to ask for seconds. TIP: There’s a key difference between calling for tsokolat-eh or tsokolat-ah. See if you can get someone at the house to tell you the story. If you want to buy your own tablea and batidor you’ll find some in the curio heritage shop on the lower floor of the house. There’s a lot to see at Camiña Balay nga Bato, from antique furntiure, to old photographs, collections of pottery, religious altars, and relics recovered from other ancestral houses in Iloilo. But if you have a penchant for textiles, you’ll definitely enjoy checking out the weavers working the looms on the ground floor, and running your fingers over the lovely fabrics for sale. A visit to Camiña Balay Nga Bato is one of the best things to do in Iloilo. Set aside several hours to enjoy the whole building and the good eats. And if you’re looking for a few interesting mementos to take home, the curio shop has you covered.